The staff were very helpful and the facilities were good. Great location. Great beach. The pool was nice and the food was good. There was entertainment for kids but it seemed geared toward younger children. My kids are only 6 and 9 and they were'n't interested in the kids corner happenings. Also the nightly entertainment was just okay. There was at least one night of fun upbeat entertainment. Beautiful place for a vacation we really enjoyed it! 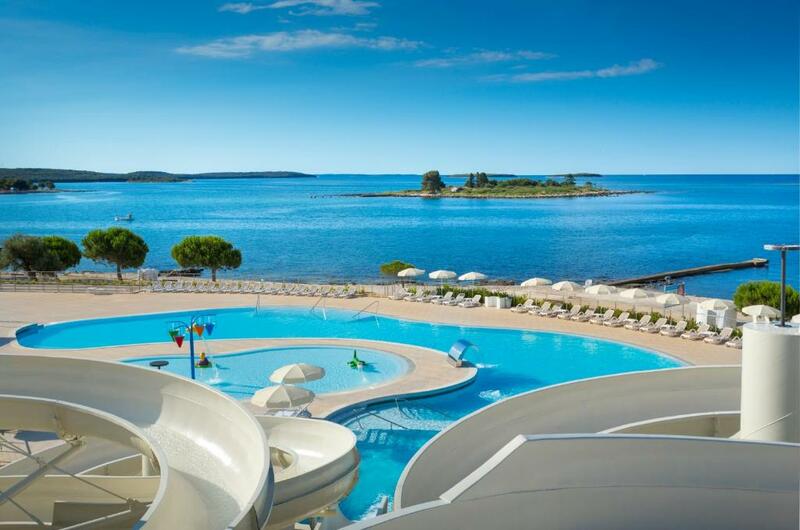 Lot of activities for children and also lovely pool for children. Pool area really great and also the Beach ( not sand though which is normal in Croatia). Great supermarket facilities and restaurants. Friendly hosts etc. 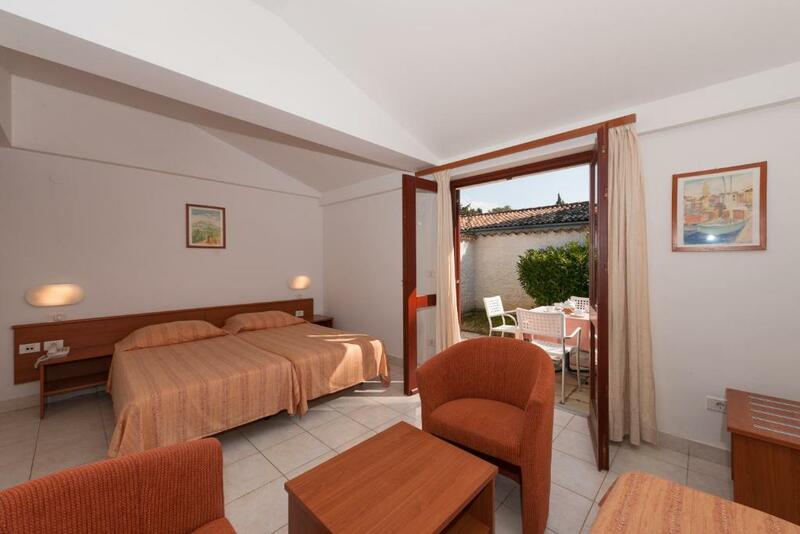 Good access to the centre of the city, peaceful accommodation, good restaurant, the beach and the swimming pools. 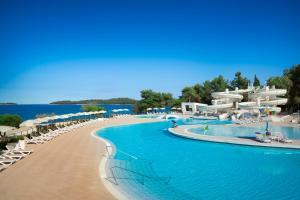 Location, facilities, nice and not too-crowded pool and beach area. Super nice staff at kids' places. Not too crowded and good food restaurants, especially the grill one. Easy parking. The breakfast was more than enough. The enviroment was not noisy. The see was near to apartament. The hosts were nice. The swimming pool was great. Good snorkeling area and nice jogging route along sea side (but these are anyway free for everyone). Villas Rubin Apartments This rating is a reflection of how the property compares to the industry standard when it comes to price, facilities and services available. It's based on a self-evaluation by the property. Use this rating to help choose your stay! 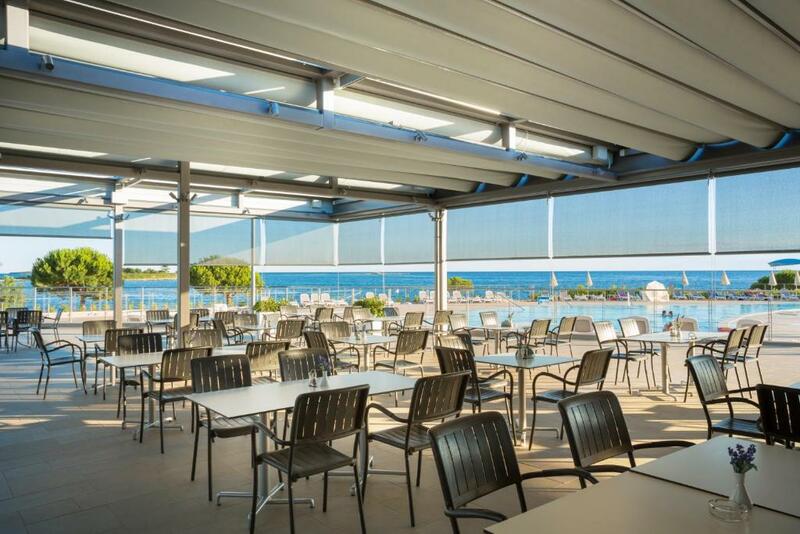 Located in Rovinj, 2 mi from the center, Villas Rubin Apartments offers an outdoor pool with sun loungers and an on-site bar and restaurant. It is surrounded by a pine tree forest and located just 150 feet from a beach. Free WiFi is provided in public areas. Numerous water sports facilities can be enjoyed on site. Guests can also find tennis courts, a children's playground, as well as scooter and boat rentals close by. There is a tourist agency located close by as well and diving trips can be organized for a surcharge. 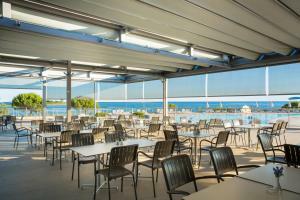 All accommodations units are fitted with a terrace and a seating area. There is a kitchenette in each unit, while private bathrooms provide a shower. Some properties have air-conditioning. Parking is free and the reception is open 24 hours a day. Activities in the surrounding area include cycling, diving and billiards. 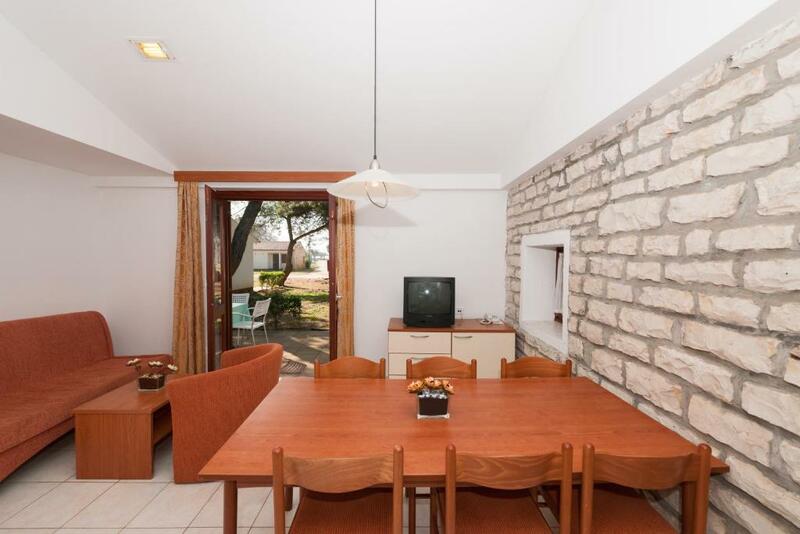 The property is 1.3 mi from Monvi Center in Rovinj and 1.4 mi from Punta Corrente Park. If you feel like visiting the surroundings, check out Rovinj Marina, 1.6 mi from the property and Carera Street in Rovinj, 1.9 mi away. Pula Airport is located 17 mi away. Airport shuttle can be organized for an additional cost. When would you like to stay at Villas Rubin Apartments? Studio with a private entrance. It features air conditioning, satellite TV, a kitchenette with a fridge and a balcony or patio. Apartment with a private entrance. It features a flat-screen satellite TV, a kitchenette with a fridge and a balcony or patio. The apartment has a seating area with a sofa bed. Apartment with a private entrance. It features satellite TV, a kitchenette with a fridge and a balcony or patio. The apartment has a seating area with a sofa bed. Only a few kilometres south of Rovinj, you will find the resort Villas Rubin, a serene retreat blended harmoniously with the coastline in the shade of pines and olive groves. House Rules Villas Rubin Apartments takes special requests – add in the next step! Villas Rubin Apartments accepts these cards and reserves the right to temporarily hold an amount prior to arrival. Excellent location. Very clean. Very well maintained greens. Pizzeria on site very good great waiters. Old furniture and a lot of spiders. The place is very nice. We felt the price of Villa Rubin’s with its good facilities/rundown villas was fair, but we were extremely unimpressed when we found out we had to pay extra to use some of the facilities; the sun beds/parasols around the pool cost approx €10 per days for 2 beds and a parasol and the waterslides were an extortionate €40 per person for a week. This is really greedy and wasn’t mentioned anywhere when we booked. It really added to the overall cost of our holiday because we’d promised our children waterslides. 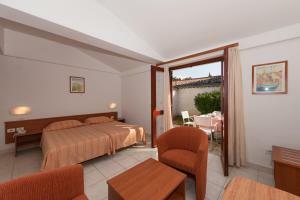 We were also disappointed because we chose Villa Rubin’s because it advertised sailing from the complex. In reality, the translation is incorrect and this piece of coast offers no sailing, just banana boats, motor boats and excursions. My son was extremely disappointed he wasn’t able to sail on his 10th birthday. We enjoyed our time in Rovinj but these negatives left quite a sour note. The whole complex needed to be updated and freshened up, the buildings / accommodation blocks looked shabby and needed to be painted and interiors updated throughout. We spent our holiday there at the second time. Last year were completely satisfied. This year not...Official check-in was at 15.00 pm. We arrived after 17.00 pm and our apartment was not ready for check-in. Even after immediate complaint we could move in the apartment at 20.30pm. The manager offered us at the end a dinner free of charge. You have to pay extra, DAILY, to use the slide and the chairs and umbrellas that are at the resort pool. The resort you've already paid to be a part of! This was the most ridiculous thing I've ever seen. Also the nightly entertainment was better suited as background music for dinner. It wasn't much of entertainment, except for one night a week. I would't stay here again, nor would I recommend this place. Acces to the sea, dangerous. Many big rocks in the sea. The bed was painfully soft, its material gave a feeling like swimming in water all the night. Pain in the nack and back for the morning.